2910 Granada Blvd – Sold in 1 Day! Listed on June 19th, 2013, we knew the beautiful home located at 2910 Granada blvd would be an immediate hit. What we didn’t know is that it would sell in just one day! The prime Coral Gables location and the exceptional character of the home made this listing fly off the market. This beautiful, gated home in Coral Gables is remarkably detailed. Its is completely updated with gorgeous marble flooring in main living areas & original maple wood in the bedrooms, and plantation shutters on all windows. 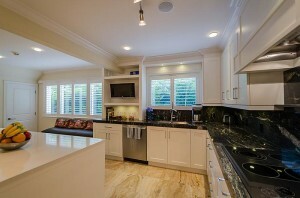 The stylish kitchen has solid wood cabinetry, granite, and stainless steel appliances. There is Smart house technology installed in home, including controlled lighting and surround sound in every room. The floor plan includes 4 spacious bedrooms, the master suite has walk-in robe and ensuite and is the only room on 2nd floor for privacy.